Written by Alex Towns. Uploaded 24 January 2006. After a comfortable night parked on our plush concrete pitch in the hotel campsite (it must have been our first totally flat pitch, so no need for the normal directing of Maz backwards n forwards, side to side to get it perfect!) we showered in the acceptable toilet block with oddles of hot water – ahh luvley! 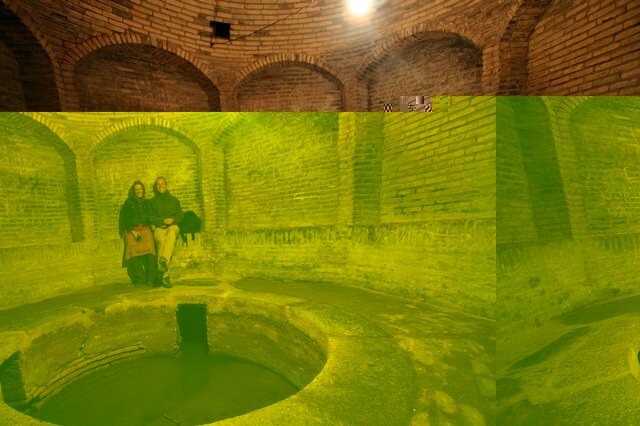 We’d decided to stroll around Esfahan on our own today so after parking our cars on the opposite bank of the river and a quick visit to a bank to change some USD we bade farewell to Martin and got down to some intense sight seeing. We ambled into Imam Square, home of arguably the most majestic collection of buildings in the Islamic world. 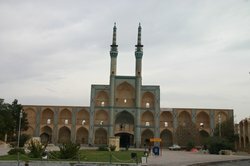 Formerly known as Naqsh-e Jahan (pattern of the world) the square was designed as home to the finest jewels of the Safavid empire, the incomparable Imam Mosque, the supremely elegant Sheikh Lotfollah Mosque and the indulgent and lavishly decorated Ali Qapu Palace. Having soaked up the splendour of the square we decided to have a look at Imam Mosque first off. Just as we got through the front gate however, the call for prayer started up and we were told that the mosque would be shutting for prayers. No problem as there is much to look at around the square so decided instead to start at Ali Qapu Palace. Unknowingly we walked past the ticket booth and were called back to make sure we’d paid our entrance fee – oops! Built at the end of the 16th century, the majestic six storey palace was to serve as a monumental gateway to the royal palaces which lie in the parkland beyond. Once inside you climb a series of stairs and finally emerge on the veranda with its 18 slender columns overlooking the square. This is where the shah used to relax and watch over the polo matches being played below. The palace is slowly being restored, in fact one lady was repainting one of the murals, so apart from a few rooms to look at there wasn’t an awful lot of interest. Directly over the way though was Sheikh Lotfollah Mosque which looked truly splendid. 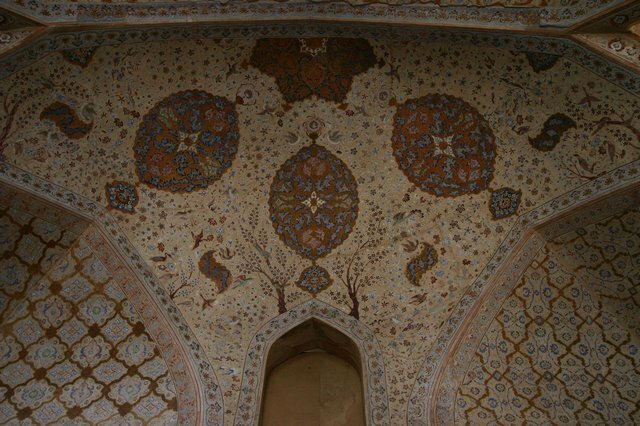 Built between 1602 and 1619 during the reign of Shah Abbas I, the pale dome makes extensive use of delicate cream coloured tiles that change colour throughout the day from cream to pink. 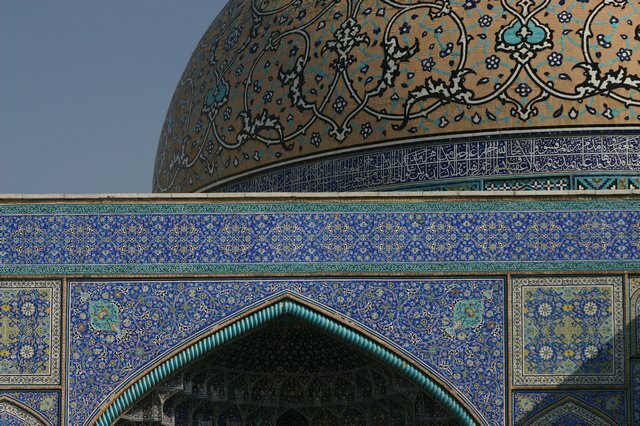 The signature blue and turquoise tiles of Esfahan are only evident around the dome’s summit. 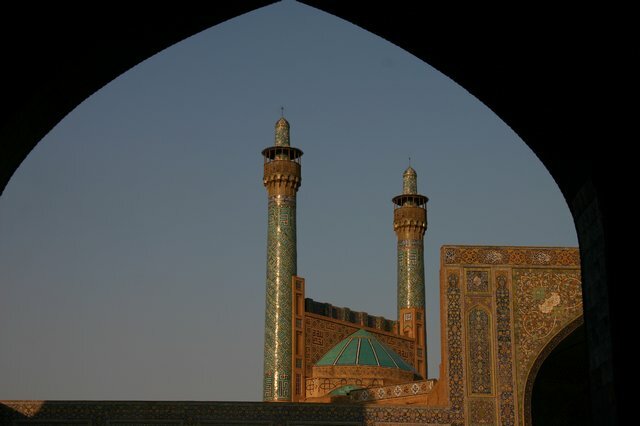 The mosque is unusual because it has neither a minaret nor a courtyard and because steps lead up to the entrance. 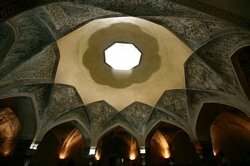 This was probably as the mosque was never intended for public use, but rather served as a worship place for the women of the shah’s harem. 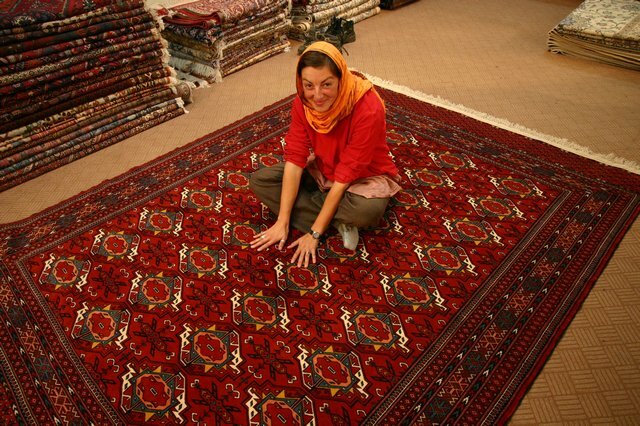 After loosing ourselves in the Mosque for at least an hour it was time to rendezvous with Martin back at the carpet shop. Having spent a shah’s ransom, Hossein had kindly invited us back for lunch which he freely does for all his visitors. We were soon tucking into rice, chicken, aubergine and bread, finished with chi and the thin caramelised sugar that reminded us of ‘bonfire toffee’, whilst sat cross legged on one of his carpets unrolled from stock! I’ve never concentrated so hard on not making a mess whilst eating with one hand! It was also an opportunity to have another look at the carpet bags (Lurs) used for hauling belongings from place to place on the back of a donkey. We all know there’s no such thing as a free lunch and obligingly we offered to take a bag each off his hands – I’m sure Damien won’t mind carrying it home when he joins us in India! Revived it was now time to hit the Imam Mosque. Said to be one of the most beautiful mosques in the world, the richness of it’s blue tiled mosaic designs and it’s perfectly proportioned Safavid era architecture form a virtually stunning monument to the imagination of Shah Abbas I. Although the entrance portal who’s purpose is mainly ornamental rather than spiritual was built to face the square, the mosque is subtly angled to face Mecca. The entire mosque is rich in lavish decoration with magnificent geometric designs, floral motifs and calligraphy by some of the most skilled craftsmen of the age. We wandered around gazing at the splendid architecture and enjoy the sublime stillness and quiet which we have come to associate with visiting a mosque. The main sanctuary is roofed by an enormous dome, itself highly decorated with a golden rose pattern surrounded by concentric circles of busy mosaics. The interior ceiling is 36.3m high, although due to a double layering used during construction, the exterior dome reaches 51m. The resulting hollow space gives rise to some amazing echoes. When stood in the right place (the black paving stones under the centre of the dome give you a hint) and stamp your feet, you can hear the echo bouncing back and forth, 49 echoes to be precise although only 12 are audible to the human ear! With the afternoon drawing on we decided to return to the square to savour some of the evening activities as the square comes alive with local families. In the process of strolling towards the bazaar at the opposite end we were greeted by a number of people and were soon deeply engaged in conversation explain why we were in Iran and which city we liked best so far. We’ve noticed that they are always extremely keen to get a photo of themselves stood alongside us for their own holiday snaps, which seemed a bizarre concept to us. With quite a crowd gathering all wanting to say hello and most with good English we enjoyed the experience. 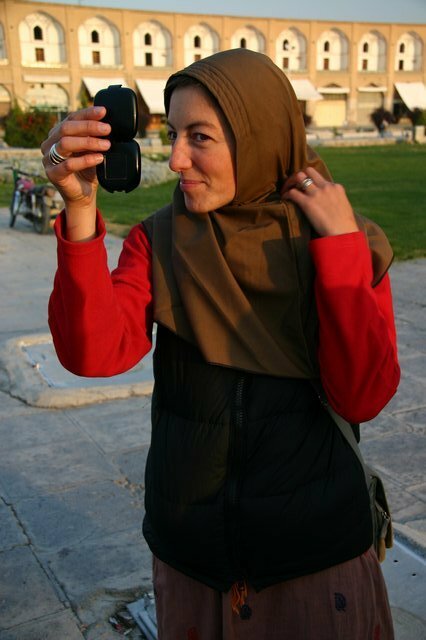 Maz even ended up buying a Maghnae (a pre-sewn head scarf so she could just slip it over her head and be instantly presentable in public!) with advice from the local girls. They couldn’t understand why Maz wanted black as she looked simply ‘beautiful’ in the beige – at least something would finally coordinate with the rest of her wardrobe which up to then was looking like a chameleon’s worse nightmare! The sun went down without us hardly noticing and finally we managed to reach the Qeysarieh Portal at the entrance to the Bazar-e Bozorg and disappeared inside. 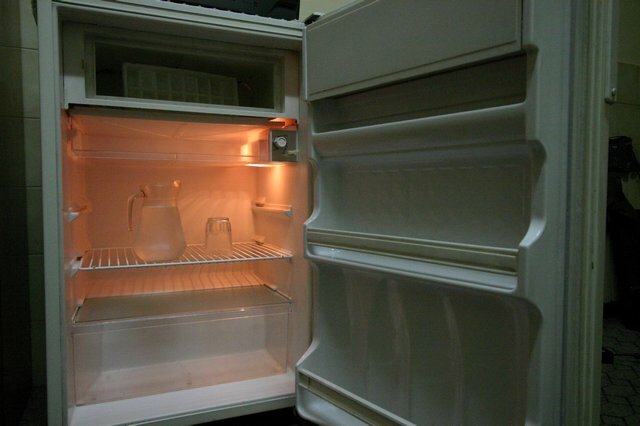 Two things on the shopping list – pressure cooker and pistachios. We stumbled across pressure cooker alley and browsed the many shops selling the same selection until we found just what we were looking for and at the right price. Shopping in these places really is easy. They have a street for everything. If you can’t find it in one shop or it’s at the wrong price all you have to do is go next door and so on until you’ve got what you wanted. However pistachio street works in a different manner, it’s more like pistachio corner as every corner seems to have a nut & seed shop – these lot are nut mad! I’m sure most would sit quite happily munching their way through a box of Trill. I found pistachios in every size and flavour expect for simply salted. They have plain, saffron and a kind of salt n vinegar all in small, medium and large sizes. It was still quite fun sampling the goods. Maz was getting used to just walking past a stall and cheekily grabbing a handful of some nut or seed then chomping on them as we carried on down the alley. We did however find some particularly juicy and delicious Bam dates, so settled on two boxes of those instead. Although our carpet and carpet bags had all been selected and wrapped up, we still had one final visit required to the shop, not for the chi and wafer thin toffee, but to actually pay for our goodies. Needless to say we were running a little late, but found Martin sat comfortably in front of the ‘free’ internet that Hossein offers to all. We were eager to see our carpet one final time before it was shipped home, as there was absolutely no space we could have squeezed it into poor Tinfish. Maz sat in the middle of our new Turkman carpet one last time dreamily imagining where in the house it would best fit. I have to congratulate Hossein on his shops near comatose method of selling. Absolutely no pressure what so ever, making the whole process of selecting and buying a carpet an enjoyable and memorable experience in itself – and I’m the last person I’d expect to hear that from! (Nomad Kilm & Carpet Shop if anyone happens to be passing!) When we finally got around to paying it was no different. Of the countless options available we decide to use Martin’s euro traveller cheques (thanks for the carpet Martin ;o) but unfortunately these were back in his car safe parked across the river. No problem – onto the back of a motorbike and Martin got a death defying ride through the traffic of Esfahan to boot. 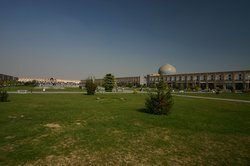 After a thoroughly enjoyable stay in Esfahan we walked back to the cars via a rotisserie chicken shop – we’d not seen rotisserie chicken for some while and were keen to sample it again. Wanting to find a bush camp for the night we stashed the chicken in the car and headed out of town. Finding camp was easier said then done, with the suburbs sprawling for some way. 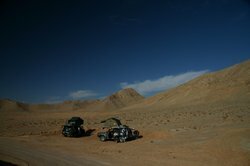 Eventually we got to a break in the lights and darted off into the desert only to find the beginnings of a road under construction. 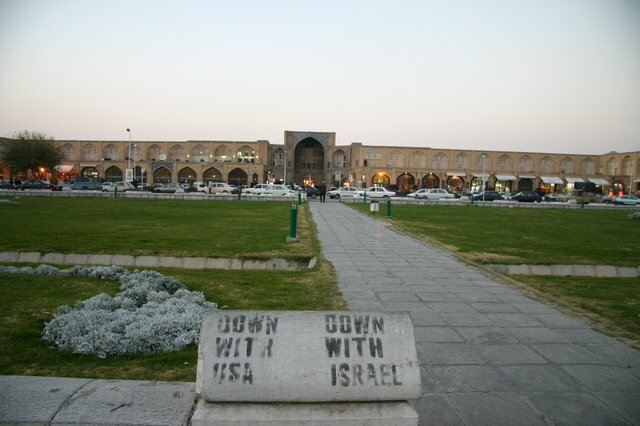 This was to become a common theme throughout Iran. You didn’t have to venture far to find another graded dirt road marking the path of another highway being built. In a few years time it appears the whole country will be criss crossed by new highways. Hoping work on this stretch wouldn’t start too early in the morning we drove down the bank, nosed the cars into a scraping made by a bulldozer and levelled them off as best we could. We’d originally had great plans to cook up a dish with the chicken, but knackered after a long day and too damn cold, we simply tore at it with bread like a pack of savage animals. Then with the tent up quick smart and all our sleeping bags, duvets, woolly hats and blankets for warmth, drifted off to the sound of dogs barking in the distance. Up early the next morning to brave the cold, we packed up whilst having a breakfast of dates and cinnamon biscuits topped off with a malaria tablet – divine. Today was another long days driving to get as far as Shiraz. None of us had realised just how high a lot of Iran is. For many days now we’d been averagely higher than 1500m. Today I think we found the highest dual carriageway of the trip which in some places was as high as 2400m! 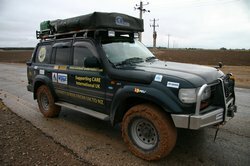 We stopped to fill up – another hard earned pound spent on 100L of diesel – and I took the opportunity to rotate the tyres front to back, which I try to do every 10,000km. A further 50km down the road I pulled over to tighten the wheel nuts, just in time as then the heavens opened and it poured down, following us the whole way to Shiraz. We had a vain attempt to find camp and twice popped off down a track which had turned to very slippery mud and clung to the wheels. Accelerating when back on tarmac Tinfish slipped sideways like driving on ice. Martin tried another lead, but again had a somewhat interesting drive back down the hill as the back wheels tried to overtake him. We saw one track that looked ideal, but even in the dry it would have been a challenging steep climb, so decided not to face certain disaster and with that called off the hunt for camp, it’d be another hotel tonight. A bit tired and wanting a change from kebabs we thought we’d try the fast food pizza place across the road from the hotel, although the Lonely P warned against it. Wondering what flavour pizzas would be on offer, we thought we’d worked out the system in place and paid first before selecting our pizzas. Ahh ok they only come in one flavour – pizza flavour – ok 3 of those, which came with loads of tomato ketchup sachets!! It appears the pizza’s here don’t have a tomato base, instead they literally smear heaps of ketchup all over the top – hmm! Still it wasn’t kebabs and we had a well stocked Iranian mini-bar! We awoke to the rain, not the best for a days sightseeing. Again we decided to explore on our own, but the rain dampened our enthusiasm so we started off slowly in a juice bar where we savoured a glass of banana and milk and a plain kiwi fruit – yummy. 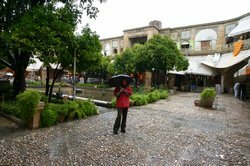 After investing in a brolly we thought there must be a covered bazaar, every city has one of those and on the way stumbled across a tourist info next to the fort. Talking with the lady she kindly informed us that this was the first rain of the year and that it had been falling for 3 days solid – great. We ambled around the bazaar dodging the puddles and drips from the none too water proof roof and basically killed a bit of time. The highlight was being quietly asked if we wanted an ‘anti American’ stamp! Leaving the bazaar we found a renovated Hammam which has been turned into a restaurant with local music playing. We wandered in, but it was a bit too touristy and with one look at the inflated prices, used their toilet then left. We found a more down to earth local establishment with their own live music and it was out of the rain – perfect. Spoilt for choice I went for the Chicken Kebab with Rice whereas Maz tried the tasty sounding Lamb Kebab and of course some bread to help it go down. All that was missing was a fine glass of Shiraz…! Fed, watered and entertained – or were we the entertainment again! – we thought we should at least try and get some sights done, so with a slight lul in the weather we headed for the Mausoleum of Shah-e Cheeragh which was erected over the grave of Sayyed Mir Ahmad in the 14th century and is an important Shiite place of pilgrimage. We didn’t get very far into the enormous courtyard before being told quite sternly that it wasn’t open to non-Muslims and to leave. Across the road is Martyr’s Mosque, one of the largest ancient mosques in Iran with the courtyard covering some 11,000 sq metres. It now lives under acres of unsightly corrugated fibreglass and was closed, so not much of interest there! 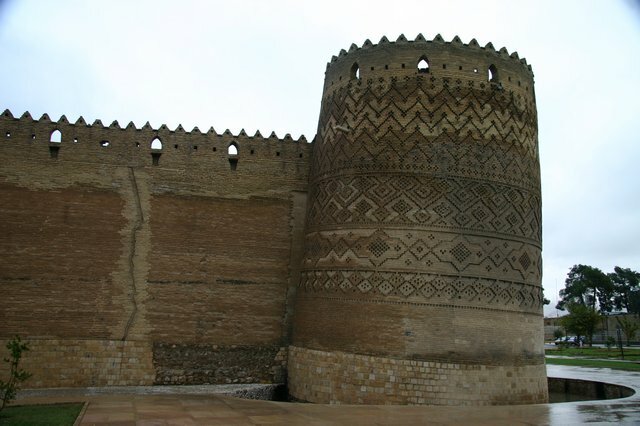 With our meet time with Martin fast approaching we thought we should at least walk around the fort, Arg-e Karim Khani, to say we’ve achieved something. Pretty enough from the outside (if a fort can be pretty!) it’s most noted for one of its four 14m high circular turrets which is leaning outwards. Apparently experts (in sloping towers I suppose) as far away as Pisa in Italy have given up efforts to correct the slope. Finding martin back at the cars his spirits had been equally as dampened so we decided to head on to the main reason we come this way, to see Persepolis. I’m sure at the right time of year Shiraz would be far more appealing as it is also famed for its picturesque gardens, but that’ll have to wait for a return visit. The nightly hunt for camp ensued. On average this activity will take us about an hour to find somewhere remote enough with the correct number of barking dogs and the mosque tucked just over the hill out of sight and unheard until the dawn call for prayers! After trying our luck down a raised track where we literally sunk up to the axles and needed low ratio 4x4 along with centre, rear and front diff locks engaged, we decided to turn around and drag Tinfish back out, narrowly avoiding slipping off the track entirely and ending up in the field. Made a great mud mark on the road though, after hitting the accelerator and showering everything with mud. Martin called over the handheld radio as his CB was still minus an aerial thanks to some thieving oik in Egypt. Although no camp (he let us listen to his mud being flung from the tyres), he had found a tourist lodge, out of our league but perhaps we could stay in their car park. Much negotiation later we agreed we’d tuck away in the corner of the car park to keep out of sight and could only use the showers in the main reception/dinning area between 11pm and 5am, but we could use the loos as we liked – cool. We parked close together and put up a tarpaulin between the cars and a fence to keep us dry if the rain started up again. Out with the pressure cooker and another chicken stew was on the go. Ok so we weren’t being too adventurous with our own food either, but then it was hard to find meat other than chicken that you recognised and that was normally still clucking before being selected from a basket! At least we worked out they were happy enough to do the Tesco’s behind the scenes preparation bit, so we ended up with a plucked and gutted bird, sometimes even jointed. Up early for our 5am showers – yeah right! They probably thought our chicken stew must have gone straight through us as both Maz & I were both ages in the bathroom and still no one twigged when we left perfectly clean and groomed. Martin being less rebellious adhered to the rules so we were glad he was in his own car. At the gates to Persepolis they tried to charge us a ludicrous amount for parking, more than actual entrance to the site, so we said if they looked after the cars we’d pay when we left. From the outside much of the ancient city is obscured by the high walls. You then enter as it was during the days of Achaemenid Persia, via the monumental Grand Stairway, caved from massive blocks of stone but with shallow steps so Persians in long elegant robes could walk gracefully up into the palace – how vain! Whenever important foreign delegations arrived, their presence was heralded by trumpeters at the top of the staircase. Acolytes then led the dignitaries through Xerxes’ Gateway, also known as the Gate of All Nations, which is still a wonderfully impressive monument. 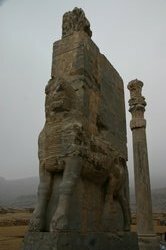 Built during the time of Xerxes I, it is guarded by bull-like figures which still stand proud. An inscription in the Persian, Babylonian and Elamite languages declares ‘I am Xerxes, Great King, King of kings, King of lands, King of many races…son of Darius the King, the Achaemenid…Many other beautiful things were constructed in Persia. I constructed them and my father constructed them’ – so there! 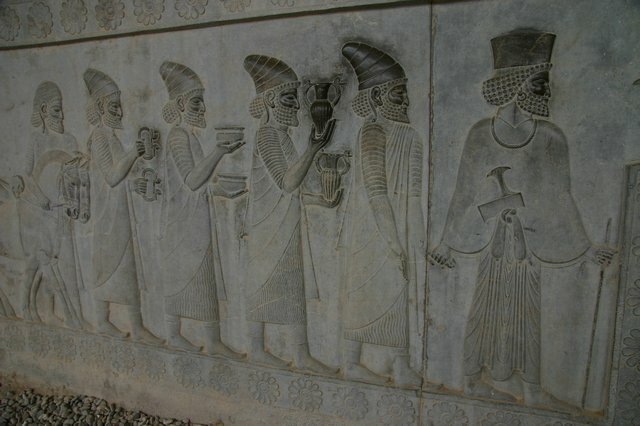 Lesser dignitaries were led to the Palace of 100 Columns where they came to restate their loyalty and pay tribute in a ritual reassertion of the power of the Achaemenid Empire. More important Persian and Median notables were ushered to the Apadana Palace. Constructed on a terrace of stone, the palace was reached via another staircase and what an absolutely wonderful staircase it is. 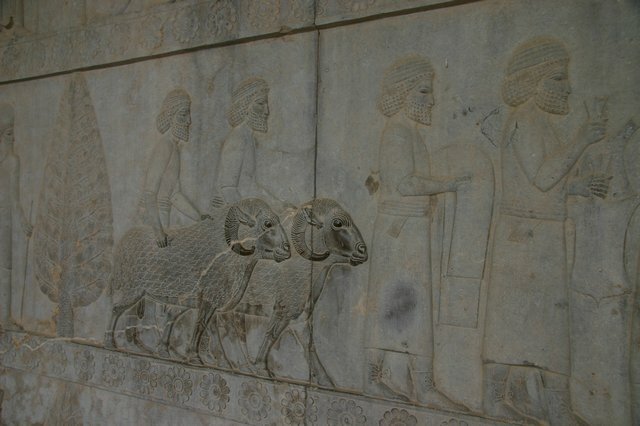 Adorning the walls are the amazing bas-reliefs intricately caved out of the stone and remarkably well preserved. 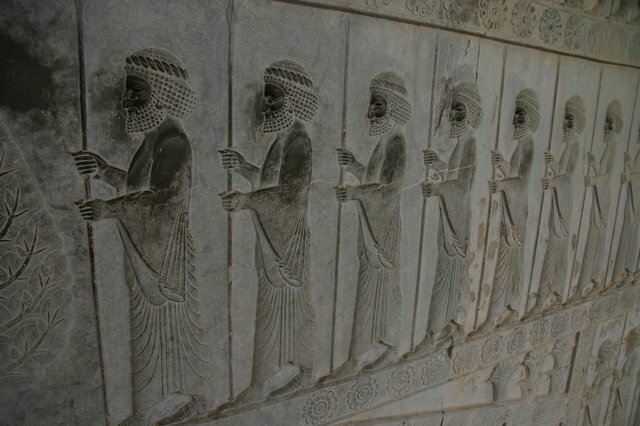 The northern panels recount the reception of the Persians in their long robes and feathered headdresses along with the Medes in their shorter robes and round caps. 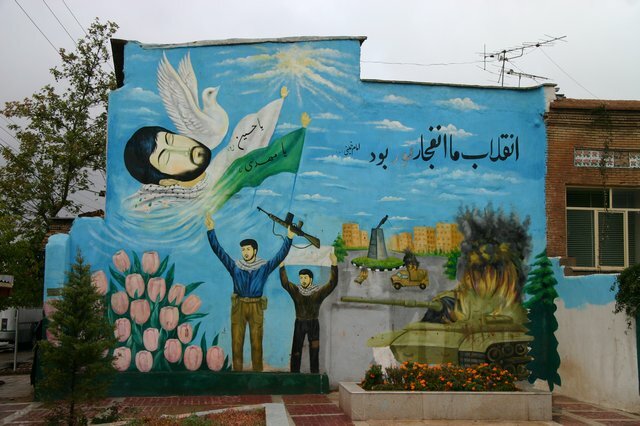 The stairs themselves are guarded by Persian soldiers. 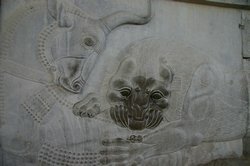 There are also vast depictions of a lion attacking a bull which symbolises the cycle of sun and moon. 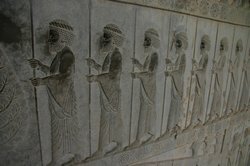 The most splendid has to be the panel showing 23 delegations from various nations all bringing their tributes to the Achaemenid king. Represented are Ethiopians, Arabs, Thracians, Indians, Parthians, Cappadocians, Elamites and Medians all with their own symbolic gifts. This panel most strongly evokes the great power of the Achaemenid Empire. Work on Persepolis began under Daius I (the Great) in about 518 BC. 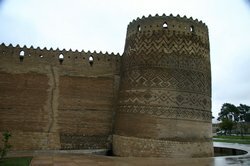 It was added to by a host of subsequent kings over a period of about 150 years. 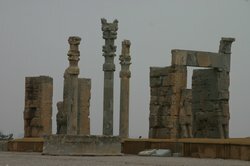 The ruins today are a mere shadow of Persepolis’ former glory, but their very existence is due in part to the fact the ancient city was lost for centuries, totally covered by dust and sand. It wasn’t until the 1930’s that extensive excavations revealed it’s glories to the world once again. 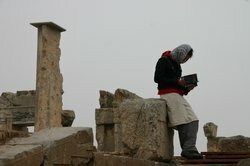 We totally lost ourselves in Persepolis for hours, we weren’t quite prepared for how fantastic a sight it was. 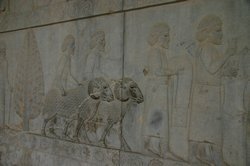 After exploring the ruins and gazing in wonder at all the bas-reliefs we climbed the hill above the Treasury to have a look at the rock-hewn tomb of Artaxerxes II with it’s own splendid Zoroastrian carvings. 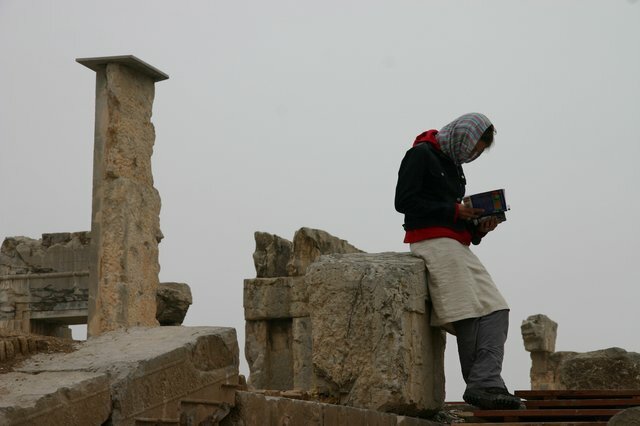 From here the view over Persepolis is quite beautiful, it must have been magnificent in it’s hey day. Returning to the cars we realised the back gate of the car park was unattended, so avoided a ridiculous parking fee by slipping out un-noticed. 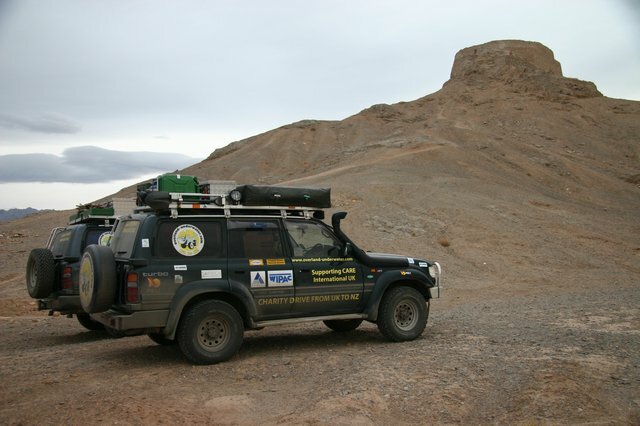 We now had to retrace our track back towards Esfahan before crossing over toward Yazd. 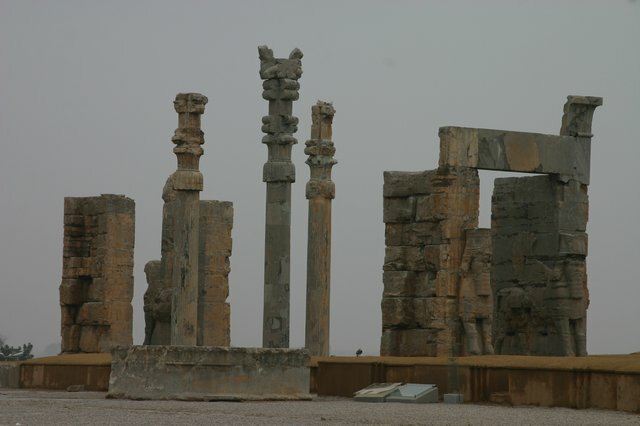 This took us past Pasargadae another set of Achaemenid ruins which pre-date Persepolis having been built in 546 BC. We knew the site wasn’t as well preserved as Persepolis, but as we were passing thought we’d pop in. 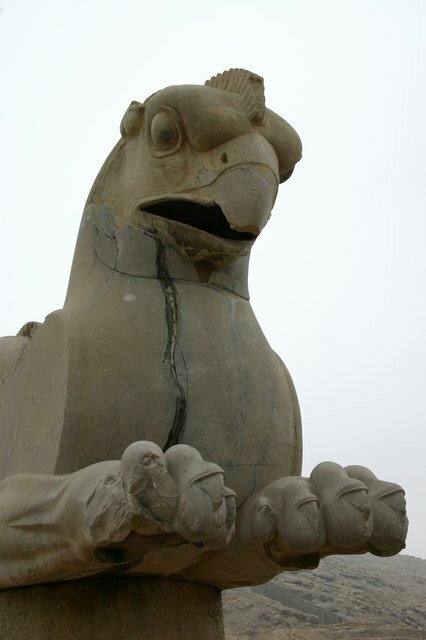 On all the blurb the main attraction is the six-tiered Tomb of Cyrus which stands proudly on the windswept plain. Unfortunately we could see from the entrance gate that this was covered in scaffolding, so as this is the best preserved of the Pasargadae ruins we decided to press on and look for camp before dark – a novelty in itself! Travelling back along our high altitude highway we passed two cop cars who waved us down… what now? They just wanted a chat (in Farsi) and were obviously bored when they saw our two foreign vehicles heading towards them. Martin had to persistently refuse them the chewing gum they were keen to nab off him. After waves and handshakes we were on our way again. Thankfully only a few people back at the border seem to know about the license plate rules! We found a potential track leading off the road and as is now custom one of us tries the lead whilst the other keeps looking. It had potential and gently undulated away from the road so we’d be out of sight. None too surprising we soon hit another graded road/highway under construction! It’d do, so we radioed Martin in. At 2475m it was our highest camp so far by a long way and we were expecting a cold night. Time to deploy the ‘BALLROOM’. Martin had carted it this far, so tonight was the night to give it a go. Basically it’s a large dome tent outer shell with nothing inside so makes an ideal shelter. There’s no groundsheet but it comes right down to the ground so should hopefully be quite effective against the wind. We all got down to chopping and preparing the nights dinner – no surprise chicken, but this time we got a bit fancy and added whole grain mustard (credit Maz) but try as she might she couldn’t find the normally accompanying cider to complete the sauce! Nevertheless it was delicious and we tucked in, wrapped up in fleeces, jackets, hats n gloves. 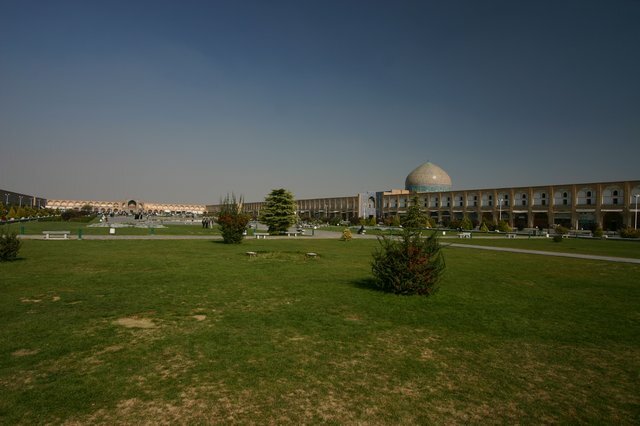 In the morning we packed up camp and continued on our way to Yazd which dates from Sassanian times (AD 224-637) and boasts ‘the best old and still inhabited city in Iran’ – in fact UNESCO go a step further and claim Yazd to be one of the oldest towns on earth! Its skyline is dominated by the many Badgirs (wind towers) and the mud brick old town is delightful. It became an important station on the caravan routes to Central Asia and India, exporting its silks, textiles and carpets (no Maz) far and wide. 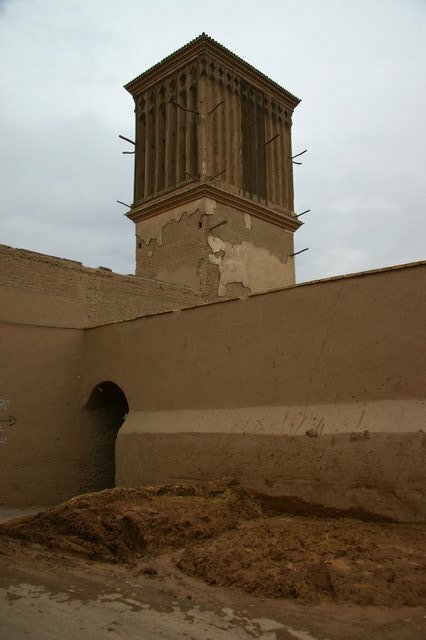 When Marco Polo passed by, he described Yazd as ‘a very fine and splendid city and a centre of commerce’. 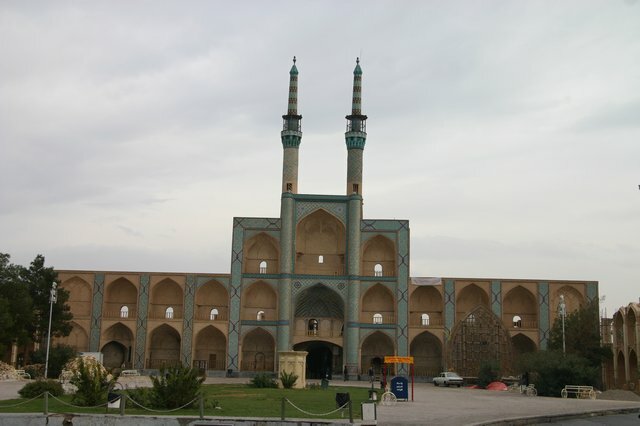 Yazd is also home to Iran’s largest community of Zoroastrians. On the way there our odometer clicked to 200,000 km’s and instantly the timing belt light came on which made me jump! We’d changed the timing belt before leaving England (twice in actual fact but that’s a different story) so I assumed the light was set to come on automatically. However almost simultaneously we noticed a screeching noise coming from one of the belts at low rpm – how coincidental! We then decided to go our separate ways for the rest of the afternoon as part of the beauty of this place is to ‘get lost’ in the old city. We wandered through the bazaar (closed as normal!) then popped out near Jameh Mosque which dominates the skyline in this part of town. It is hard not to be impressed (even after the many mosques seen thus far) at the high, tiled entrance portal, flanked by two magnificent 48m high minarets and adorned with inscriptions from the 15th century. Of unusual interest though is the stairwell leading downwards from the main courtyard. This goes down and down to part of the Zarch Qanat, which is an underground water channel particularly common in this region and now used for ritual ablutions before prayer. 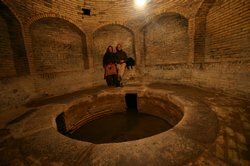 In fact there are thought to be more than 50,000 qanats in Iran and their hazardous upkeep is still entrusted to the highly skilled qanat builders of Yazd, which is where they traditionally came from. With light fading, we started to head back toward the car and rendezvous with Martin in a nearby internet café – a common necessity. On the way a gentleman approached us and asked where we were from. Realising he was keen to practice his English, he accompanied us as we strolled back down the street, stopping at a nut n seed stall as I’d spied salted pistachios – bingo! They were surprised when we ordered a kilo – yum. Mansour was a teacher at one of the local schools and he was soon inviting us back for chi. We tried explaining that we first needed to meet Martin and there was actually 3 of us, but I’m not sure how successful we were. Arriving at the internet café, of which there was a choice of two, we couldn’t see Martin. We carried onto the cars to shown Mansour and let him read our Farsi flyer. Surprised that Martin would be late we tried the café again, only to find him hidden in a little booth… the only blonde hair poking up of the bunch – should have been easy really! We introduced him to Mansour and of course it was no problem for him to join us. Home was a drive away, so with Mansour in Martin’s car acting as navigator and us following (belt screeching) we took a small detour to pick up sweets and cakes before arriving at his house. 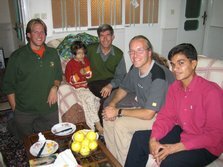 We then had a pleasant few hours being introduced to his wife and young daughter whilst chatting about nothing in particular and sipping chi along with sampling the cakes, sweets and pistachios laid out in front of us. The landlord’s son also joined us from downstairs and even though Mansour had the only English he listened in intensely to the conversations about how we’d enjoyed Iran, the weather here compared to back home and reading through the English proverb book that Mansour cherished. Time was getting on and knowing we still had to find our own home for the night we bade farewell and declined the kind offer by the landlord’s son to then join his family for chi. We pressed on into the desert just out of town and following a lead recce’d by Martin, decided it was adequate for a nights kip and had a meal of bread and dates before retiring to respective roofs. We decided on a lazy morning and by the time we were up, big trucks were moving up and down the track we’d followed, all blowing their horns to say hi! In daylight the area we’d found actually appear to be some kind of tar pit. Although most of the tar had dried up and we appeared to be on dry ground, you can just imagine the fun that would have been had we slowly sunk during the night! I took the opportunity to look under the bonnet to investigate and tighten the squealing belt and slowly realised I was looking at only two when I’m sure there should normally have been three! Having an identical car is a good way to compare and sure enough one of the alternator belts was missing. 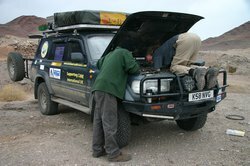 Our spares were Martin’s old belts that had been replaced by Footloose 4x4 and it didn’t take too long to work out how it all came apart. To be safe I checked the remaining belt and was horrified at its condition. For a car prepared for an overland journey I was a little disturbed at what had been done by Frogs Island 4x4, as the belts looked in a far worse state than they should for only having done about 24k since having the prep work done! In short they were knackered. Comparing with Martin’s belt’s, from the outside at least, they still looked as good as new! Another few mutterings under my breath – F*&##@$$%...!?!!?! We also took the opportunity to check Martin’s belts as he had a squeal on start up that had been bothering him for some while. Being belt experts now, we realised that his were pretty slack and that they needed tightening. Should be a quick job with only 3 bolts as identified on mine to adjust! Right – one bolt striped the edges so the socket just span, one we couldn’t find and only one actually behaved itself! We teased loose the striped bolt, couldn’t for the life of us work out how the system was still working with the missing bolt, then tightened everything up and hey presto no more squealing. A good mornings mechanics, but with a mental note to have it checked by Toyota during our scheduled 25,000 km service when we reached Karachi. 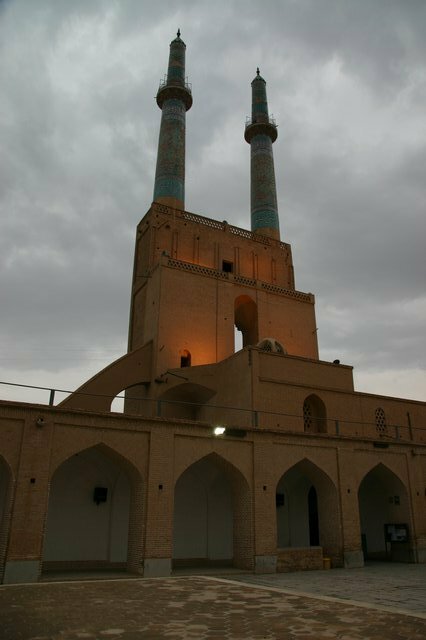 With little of the day remaining, we decided to pop back towards Yazd to see the ‘Towers of Silence’. 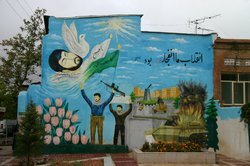 Being the heartland of the dwindling Iranian Zoroastrian community there are many associations with this religion in the region which flourished until the Arab Conquest brought Islam. Zoroastrians are followers of Zoroaster who was born about 500 BC and was one of the first religions to postulate an omnipotent, invisible god, which is represented as an ‘eternally’ burning flame in Zoroastrian temples. The ‘Towers of Silence’ is where they used to take there dead. In accordance with their beliefs about the purity of the earth, dead bodies were not buried but left in these uncovered stone towers so that vultures could pick the bones clean! A priest would sit with the bodies, which were placed in a sitting position and watch to see which eye the vultures plucked out first: The right eye and the soul faced a good future; the left and the future looked grim! These towers however haven’t been used since the ‘60s, so after exploring them and sitting on top (no vultures to be seen) we decided to push on east. Before leaving town we stocked up on some vegetables and also spotted a butchers with what looked like beef hung up. Feeling lucky we sent Maz across to negotiate a purchase and she proudly returned with about a kilo of steak after having to stop the chap pile more and more meat onto the scales. Our mouths watered at the simple thought that we weren’t having ‘chicken tonight’ – yippee. 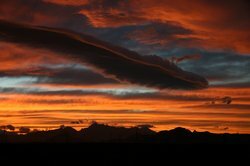 As we left the sun was just sinking below the horizon and what a magnificent sunset it was, so much so that we had to pull over at the side of the road to get out and admire the amazing view. All that was missing was a sundowner, otherwise it was perfect. Back to breaking our ‘no driving at night’ rule we pushed on leaving Yazd behind.